1. Bring the original passport that you have used to enter into Malaysia. 2. Bring Police Report for "Lost Passport", then go to your country's Embassy/ Consular Services to obtain an ETC (Emergency Travel Certificate), some countries issue emergency travel passport, some countries issue "out-pass". 3. Any Proof or valid reasons to overstayed in Malaysia. 4. Do not buy in advance air ticket till you are sure of the validity date of the exit "Special Pass" issued to you by the Malaysia Immigration at a cost of RM100 only, after the payment of compound penalties (fines). Please take note that this thread has been created as part 2 to continue from the old thread of https://www.lawyerment.com/answers/questions/11868/what-to-do-if-you-overstayed-in-malaysia?g=last#a46885 part of the reason, to be more friendly towards users with mobile devices. Although some old policies have been changed, it would be wise to read back those cases which could be similar to yours. Then people will understand the process on how the 6P, 3P, Rehiring, Amnesty and the (3+1) Surrender came about. The Amnesty is over 30/08/2018. All those remaining inside Malaysia without valid documents now are regarded as having overstayed and by administrative legal definition known as ILLEGALS. 1. This one freaked me out a little bit, so if go and surrender we will get detained? You and your family will not be detained if it is a Voluntary Surrender with proper docs. This is the biggest joke of the decade for our Immigration. It has been extended 2 times for a period of 2 1/2 years. It can never be offered ever again. At the beginning of 2018 there were estimates of more than 4,000,000 illegals inside Malaysia, at the beginning of 2019, there are still 4,000,000 estimated illegals. Old ones go out, new ones came in again. Successful amnesty? No.. to me it is a failure. In actual fact the current voluntary surrender which has a waiver on any jail term is a form of amnesty offered. Take it before it is changed again. The above pic show the passports seized from forgers by IMI raids. 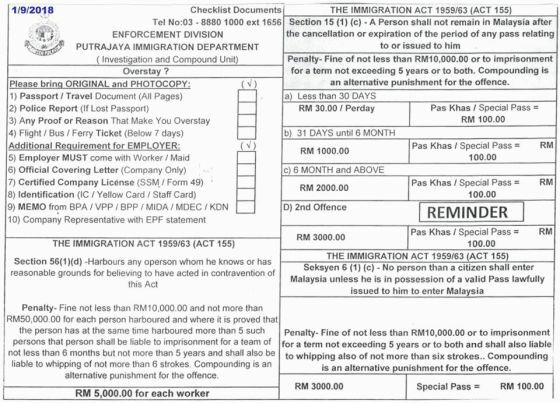 Some illegals have used the services of forgers to hoodwink IMI officers. Depending on how the police reports are made on lost of passport, some of their passports are already in the hands of the IMI Dept...!! Hence immediate arrested..!! For you, you actually do not have any other choice. The travel exit doc your Embassy have issued have an expiry date. The police report do have an expiry date too. I have a fair share of this kind of comments inside this forum itself. They are basically Trolls and Antagonist who were jealous of me giving free advices in this forum. They tried to character assassinate me. I have referred to as "An old man walking to the grave", "Jerk", Joker, Faked News spreader, Posting lies and misleading readers, etc etc. The irony is that I have discovered that one of them is my own friend in this forum...!! Some of these people have actually wanted to profit financially from their posts using faked and stolen Users ids and I can prove who some these people are, if needed to be. I just ignore them. Best is to forgive but not forget. Quotes of Gandalf from the famous movie "Lord of The Rings". So I guess the best thing to do now is to put everything in order and have all the required docs. I'd appreciate it so much if you would be willing to help me with this one. At the beginning of 2018 there were estimates of more than 4,000,000 illegals inside Malaysia, at the beginning of 2019, there are still 4,000,000 estimated illegals. I guess the root issue is the scammers in my humble opinion if they can get their hands on those people everyone would be happy. Can be 4K or 6K (with the new chart). So is it safe to assume and prepare for around 6k. I'm just trying to get a solid idea about this one cause honestly I don't have the money ready but I will figure it out quickly that's why I keep asking about it so I can know what to expect. They tried to character assassinate me. There will always be haters and their numbers are constantly increasing and you are definitely doing the best thing to with haters, which is to ignore them. I don't understand how they could keep up with themselves anyway. 1. Make a police report for lost of passport. Can say it was lost at the same time as your wife & son. you have to do it asap so that the whole family can go back at the same time. 2.To shore up your finances, have a "garage sales" with your friends helping out. Liquidate all belongings that you cannot bring back to Egypt. 3. Watch out about your tenancy agreement (if any). 4. Draft out two letters, one for yourself, one for your wife. Both letters includes details of the whole family for repatriation back to Egypt. And the reasons for the overstay. Email me and i will edit to add something more. 5. You have to prepare funds for all the air-tickets back to Egypt. Do not buy yet till you have the validity dates on the special pass issued individually to everyone. 6. Do inform your wife not to make erratic decisions. Although MY IMI have given you special pass to exit Malaysia, even yourself or your wife cannot board the plane individually with an infant.who was born inside Malaysia. Both of the parents must be there or have consent letters via Embassy from either party in order to pass Airport Security. This is for prevention of the infants smuggling from the Trafficking of Child's Act. And the possibility of one spouse taking away the infant in the event of relationship breakdown. I had this unpleasant experience of one Malaysian Father whose foreigner wife wanted to take their child back to her home country. It is not a religion but a way of life... A philosophy of life with adaptations from both Buddhism and Confucianism. I have read books on "Yin Yang" (on the five elements that affects one's life), The Book of I-Ching and its principles, as an avid reader on Egyptian Anthropology (before the times of the Pharaohs) of 4,000 years ago, the Indus Civilizations of 5,000 years ago. as well as Chinese Metaphysics of Life. According to Chinese Lunar tabulations, because your wife and your ages is just one year difference, the ages of 28 and 33 have "turning points" which can affects "Harmony in Marital Life". Overcome this obstacle and harmony will return back to normal. Think of the two lovely children. What happened to the sparkle when both marry each other? Due to living in a foreign land plus unable to get work permits and being cheated by scammers, your wife can get very upset after child birth (Postpartum ?). especially with two children in tow. Being back to home country may reverse the negativity in personal feelings. Late, tired continue tomorrow. Feel free to ask further Qs. I have elephant ears..!! Now I don't even have the police report that my wife made earlier and I'm not sure what was in it. (I've sent you an email explaining that the embassy took the original report from her when she was getting the Travel document. I'm not sure if this email has reached your attention). To shore up your finances, have a "garage sales"
You just addressed 2 other main concerns of mine that I was shy to ask about. I think if I am able to sell the furniture and appliances we have and also get a full refund of the deposit from the landlord it could help cover the expenses of the fines or at least get me closer. * I'm not sure what would be the most effective and fastest way to sell everything and I honestly don't have any idea about "garage sales" and also I don't have friends around here :(. I was thinking about putting ads but this could get tedious and might take a long time. ** My tenancy agreement would have been ended in next September and I was thinking about how to get my deposit back when I'm not going to complete the duration agreed upon. I had a couple of ideas and I'm not sure what works here. I thought of explaining the situation to the landlord and see if they would be willing to just return the deposit regardless of the violation (but I'm not counting on this and it's their absolute right to refuse). The second idea I had is to ask them if they would be willing to accept another tenant to replace me and I would try to find someone who could come in and pay me the deposit and continue the rent. *** Please advise me on how these things could be handled here in Malaysia. Would they be identical? I don't fully understand like 2 different letters or same thing signed by both of us. Also, I'm not sure what to include or exclude from the letters and that makes me also wonder would it be like investigation when I go there and whether this is for both of us or everyone separately. You have to prepare funds for all the air-tickets back to Egypt. Do not buy yet till you have the validity dates on the special pass issued individually to everyone. On the MY IMI website, they have mentioned air ticket as one of the required documents. Did I get this one wrong? would it be OK to go without booked air ticket? Both of the parents must be there or have consent letters via Embassy from either party in order to pass Airport Security. Thank you for the recommendations. I remember reading those two books I've mentioned was a very good experience and had a calming effect to read the concepts and the philosophy in general. I'd be checking out the books you have mentioned thank you so much it would help keep the head off things. According to Chinese Lunar tabulations, because your wife and your ages is just one year difference, the ages of 28 and 33 have "turning points" which can affects "Harmony in Marital Life". This is so interesting. I'm always interested in numbers and how I keep seeing synced numbers especially the 111, 1111, 222 and 333 :D. I wish it was a case of disharmony. I understand your point and it makes sense cause with everything going and this obstacle and I've been hearing similar thoughts from close family members back home but I just get stuck on the idea that I left Egypt in the first place thinking that this could be bringing back harmony and by the way one of us was 28 at that time. I guess that would be just my luck. In any case, I just can't think of anything other than bringing everyone back home safe cause I would not be able to handle the guilt since I dragged them into this, to begin with. So if anything happens to them after everything we have been through it would be just a killer :/. I would keep saying this because it's absolutely true I can't thank you enough from the bottom of my heart THANK YOU. You gave me hope really and shed some light on the road ahead and for that, I'd always be grateful. You can get a duplicate copy from the station she reported in too. Never make second report, this is how some people gets arrested when surrendering to immigration if the statement inside differs. The second idea I had is to ask them if they would be willing to accept another tenant to replace me and I would try to find someone who could come in and pay me the deposit and continue the rent. Draft out 2 separate letters. I do not think they would accept one letter for ALL. 1. One is for your special pass to be issued to you only You can mention your your wife children's names inside as going back as a family. 2. One is for your wife and children as per same police report. they have mentioned air ticket as one of the required documents. This is just a general guide. That chart is for those who have complete set of docs. Do you? Just take my advise and DO NOT BUY FIRST. Read at @StevevGao case (Page 87-93). He did not take my advise not buy ticket first. He nearly burnt his 3rd air-ticket..!! 2. The Appeal not to BAN me from visiting Malaysia again. Around 05/08/2018 my friends introduced me to a agent who told me that I can make an extension to my Visitor Pass for another 2 months. I believe the agent as Malaysian visitors to China were allowed to extend another 2 months. For 2 months they did not give me back my passport saying that my extension is still under processing in Immigration Department. Around 02/11/2018, I managed to get back my passport without any extension pass inside. On 05/11/2018, I went direct to IMI Putrajaya to surrender myself for overstay. The officer told me to come in after 1 week for further instructions. I went back after 1 week to be informed that I have to bring a flight ticket within 7 days. I have ran out of funds by then and waited for my family to send me funds. On 30/11/2018, I went to the KLIA Airport to purchase a air ticket but I lost my passport there. Enclosed is a copy of the Police Report on the Lost of my Passport. Ref (Doc-4) dated 30/11/2018. I wish to make an appeal to Immigration not to BAN me from coming into Malaysia to visit my friends and relatives again. There is no intention to overstay deliberately. The above circumstances have resulted me to overstay. Her letter to IMI i did not want to reproduce here. Fake agents could use it to cheat further other illegals. I managed to get her off the compound fines hook. She just paid RM100 for her surrender. But the BAN of from 5 years stays (same as StevenGao). Yes, I received your email. I was very busy at that time. Moreover I could not determine which is the actual date your whole family entered Malaysia as there were faked stamps inside. You have to declare your actual date of entering Malaysia otherwise if you declare wrongly and the officer cannot find it in the systems, you will be asked to go back in another 14 days. This is one part that gives people problems when going to surrender. Wrong or false declarations of dates of entry. Buying a ticket first will kill your pockets...!! 2. No entry stamp into Malaysia because of lost of passport. Go check your past emails on purchase of the air-tickets, this can be proof plus evidence of entry. The fake stamps you have sent me confuses me. Your passports is still with you, extract the dates inside. You cannot produce those desecrated passports to immigration, you can be jailed. Show other proof of entry. You can surrender those desecrated passports to your Embassy once you received those special pass for every member of your family. Those pass are already your travel docs out of Malaysia. Another thing just in case. Depending on the areas you are living in, should there be any immigration raids, the travel docs your wife have in possession is valid for the current stay here and is proof on intention of leaving the country. "Why you have not gone to IMI to surrender yet"
Ans ;- I am waiting for funds from my parents to be send here. There is another issue, whether there is enough time to surrender to IMI. If not enough time, after your police report is made, you still have to go there, you can ask your Embassy for extended time (most probably a new travel certificate). They would be glad to give you and get you out asap as there are two children with you. That maybe can give you another 10 days to consolidate your finances. Same answer... not enough funds for whole family now. Please remember to have photostat copies of your Police Reports and all exit docs....!! Thank you for your detailed and timely replies. I just want to make it clear that I definitely trust your advice and I'm just trying to make sure that I understand every bit of it so I can apply it exactly that's why I keep asking questions and I hope you bear with me cause sometimes I don't understand some points, so please pardon me if my questions seem repetitive or appear as if I'm doubting your advice. It's quite the opposite, as I've mentioned I want to make sure I follow your advice exactly because I trust it would be the right way. I had a few questions and I already have written them but I just knew that she had a copy on her phone for the police report so I'll email it to you first and please give me your opinion. Hello, i have questions regarding to my problem. My mum a malaysian and my dad a filipino. I was born and grew up in malaysia but due to some complication i didnt have a malaysian birth cert so years later my aunt help me to register my birth (written i am born in sabah) in the philippines by the mobile embassy and were able to get a passport but the passport has no jaminan as i still underage. And now i plan to study in the philippines and i take a new passport recently cause my old one already expired. As for now im still waiting for my passport to arrive and i been trying to find anwers for my situation. I was born here and never went to philippines and what is the procedure for me to get out from malaysia as i will be serah diri at immigration later on? Also, am i be able to enter sabah again? Thank you. Where is your father now? Currently I'm in Kota Kinabalu, Sabah. He is in the Philippines.